BUYSOUNDTRAX Records presents GODZILLA: THE ULTIMATE EDITION, featuring music composed by David Arnold (STARGATE, INDEPENDENCE DAY, CASINO ROYALE) for the 1998 action film produced by Sony Pictures, directed by Roland Emmerich and written by Dean Devlin (STARGATE, INDEPENDENCE DAY, THE PATRIOT), starring Matthew Broderick, Maria Pitillo, Hank Azaria, Kevin Dunn and Jean Reno. 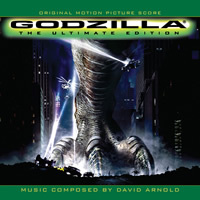 BUYSOUNDTRAX Records, under license from TriStar Pictures, presents the GODZILLA: THE ULTIMATE EDITION on 3 CDs, including the complete score to the film, along with a selection of bonus tracks and the original planned album arrangement of David Arnold’s score, previously only available as a promotional release. Following the 1993 box office success of JURASSIC PARK, American producers were on the hunt for similar properties to develop. With the failure of GODZILLA 1985 to capture and hold a modern audience’s attention, the opportunity presented itself for TriStar Pictures to pursue and reach an agreement with the Toho Company for the movie rights to one of cinema’s greatest monsters. After a first attempt to get the project going collapsed in 1994 due to a proposed budget already spiraling out of control, GODZILLA went back into hibernation again, until producer Dean Devlin and director Roland Emmerich were approached for the project. Following their great success with INDEPENDENCE DAY in 1996, they were the perfect candidates to bring the big green lizard back to the screen. After they came up with a fresh take on the subject and, more importantly, a way to bring the budget down to something more manageable, Devlin and Emmerich joined the production and shooting began in 1997. Following their great success on STARGATE and INDEPENDENCE DAY, it was no surprise that Dean Devlin and Roland Emmerich would return to composer David Arnold to compose the music for the film. Arriving in Los Angeles in 1997 to work on GODZILLA, Arnold found himself standing before a new set of creative challenges, which included frequent rewriting or rerecording portions of the score due to a constant flow of last minute changes. As a result, music was, more often than not, recorded to blank footage. Many alternate cues were also produced in an attempt to anticipate the action in several major sequences that CGI animators were still rendering. Arnold was able to overcome these obstacles, producing what many consider to be one of the finest orchestral scores of the 1990s. BUYSOUNDTRAX Records presents GODZILLA: THE ULTIMATE EDITION, featuring music composed by David Arnold, conducted by Nicholas Dodd and mastered by James Nelson at Digital Outland. The booklet contains new liner notes written by author David Hirsch. Previously released on compact disc in 2007 and difficult to find, GODZILLA returns to the market again, on 3 CDs, including the complete score to the film, along with a selection of bonus tracks on the first two discs and the original planned album presentation of David Arnold’s score on the third disc, previously only available as a rare promotional release. GODZILLA: THE ULTIMATE EDITION is a limited edition release of 3000 units.